For many, decorating their house is hard enough, and the thought of landscaping their backyard proves very challenging. However, improving the look and feel of your yard does not have to be complicated, nor does it have to be expensive. We share seven of our favorite landscaping ideas for your backyard. Lighting isn’t often thought of as a landscaping idea for your backyard, but it is one of the simplest things you can do that has the greatest affect. There are a variety of different ways you can add lighting throughout your yard. For starters, lighting all of your pathways is a really good idea, for safety reasons alone. Having lighting will make it so people can see where they are going at night and not trip and fall. Rather than having to run electrical wiring throughout your entire yard, pick up some wireless solar patio lights. They are incredibly simple to install – you can usually just push them into the group in a staggered line along your walkways. Another great way to add ambiance outside is to install some string market lights. These lights will illuminate a patio, walkway, or pool in the evening. They look really classy, and instantly create a wonderful mood for a summer evening outside. Patio furniture is expensive, but not when you build it yourself. Even better, the newest trend of building furniture from pallet wood is both trendy and cheap. Pallet wood can usually be found for free if you look around a bit. With a little effort, it can be reused as furniture. On your patio, you can build a simple coffee-style table and chairs to sit around. All you need is a cheap jigsaw and some nails – there are plenty of great project plans online. You can up your game a bit by adding some trim and siding with nothing more than some thin veneer and an 18 gauge brad nailer. After all is said and done, you’ll be left with some great furniture that you can utilize, along with some great stories for your guests. Planter boxes can be pretty much any shape and size, and can be placed throughout your yard. Typically, they either sit on the ground, with their edges raised above, or are built to sit waist high and off the ground. Planter boxes serve a variety of purposes in your yard. For starters, the box itself can be a nice addition to your yard. Especially when built and constructed nicely, it adds a finishing touch to the section of your yard that you add it to. Planter boxes can also house a number of different types of small bushes and trees, in addition to flowers or even a small garden. You pick and choose what to install based on what you want. If you want a sprig of color and pop, pick some bright colored annual flowers. Or, if you want to have some vegetables and herbs, plant a few varietals that grow well in your area. Planter boxes are a simple addition that add to your backyard’s look and feel, and can also provide some produce for your household. A lot of people skip past adding a water effect to their backyard because of expense. And, it is true that many water features require a lot of work, from piping in water to the area to upkeep and maintenance. However, a simple fountain that does not require a constant water source is a wonderful addition to a backyard. The fountain can be a wonderful accent piece in your yard, serving as a nice destination for your eyes. It can also be a great attractor for birds and other little animals. If you’re trying to save a little money, you’ll often find fountains on the cheap at estate sales. You might need to hunt around for a bit to find one that suits your style, but they typically won’t cost you much. Stepping stones are incredibly simple to add to your yard, and can help interrupt an otherwise boring landscape scene. You can drop stepping stones onto grass, dirt, gravel, and many other surfaces. The stones will create a natural pathway, which increases maneuverability around your yard, while also giving more direction and curb appeal. Stepping stones can vary in and of themselves. You can add simple, generic concrete stones. Or, you can go for something more modern by opting for slate or granite. You could also go in the direction of a Tuscan villa with large sandstone or porcelain stepping tiles. Either way you go, adding stepping stones is a quick project that will help up your backyard’s appeal and functionality. For many, simply reducing the effects of weeds and underbrush would go a long way in improving your backyard. Overgrowth can create chaos in an otherwise nice landscape design, and certain times of year such as spring make it even worse. There are several different ways to combat this problem. With any solution, your goal is to provide a more consistent and simplified look while also trying to curb the overgrowth for the future. Decomposed granite is a wonderful option for areas that you have this issue. It retains a nice, natural look when installed. It is porous, allowing water to drain through it. It also comes in several colors, giving you more control over its look and feel. Wood chips are an even simpler, organic solution. You can buy these in bags at your local home improvement store, and come home and spread them around with a rake. You can double their effectiveness by adding a weed barrier underneath before putting the chips out. With either solution, not only do you cut back on your yard work in the future, but the granite or chips look a lot nicer. Wood or metal lattices add a touch of class, while also integrating seamlessly into the natural landscape. Lattices are relatively cheap, and super easy to install. For a bonus, put it in an area of the yard where the surrounding plants can grow up and around it. Lattices work really well when you have crawling vines with blooming flowers. You’ll add a very nice feature to your yard for very little time or expense. 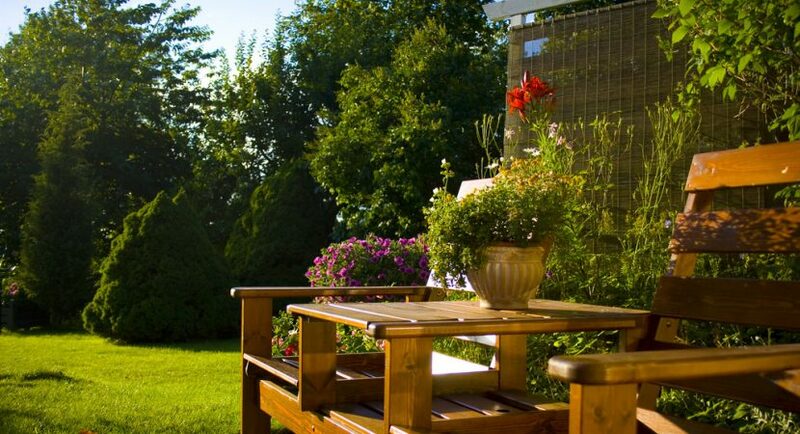 We hope you enjoyed these seven ideas for adding to your backyard landscaping! Allen Michael is the founder and editor of SawsHub.com, a website focused on helping woodworkers and DIYers find the best tools for their projects. Allen stumbled onto this need while setting out to learn how to build his own dining room table, and has since become an expert on home making projects and woodworking tips.